Thanks to the continued rise of instructions across all areas of chambers we are able to sustainably support three pupillage tenancies at 30 Park Place this year. We are delighted to be able to offer each pupil a tenancy and provide them with consistent work and experience across all areas of our practice. The placements, along with a recruitment drive for barristers 4-10 years call, means we are better placed to meet the needs of our clients in the short and long term. 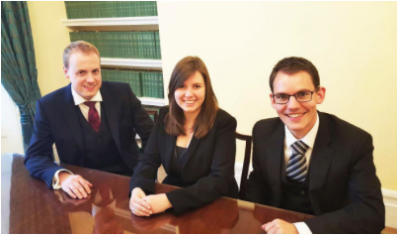 Our three new tenants are Samuel Shepherd, Nia Wynn Gowman and Peter Donnison (pictured L-R, above). We are able to offer the highest number of pupillage tenancies in a Welsh set this year thanks to the success of our business development plan and long-lasting client relationships. We are also one of only two chambers in Cardiff to offer pupillages this year. “We have been very lucky to have had the opportunity of training Nia, Peter and Sam during their pupillages. We are delighted that they have all accepted our invitation to join chambers as tenants. If you would like further information on any of our new tenants or to book a member, please contact our clerking team via clerks@30parkplace.co.uk or call us on 02920 398 421. Peter studied law and the Bar course at Cardiff University before being called to the Bar by Lincoln’s Inn in 2012. During his pupillage he has been under the supervision of Tracey Lloyd-Nesling (Crime) and Max Davies (Family) and gained a broad experience across all areas of chambers’ work. Samuel grew up in Cardiff and completed his law degree at the University of Leicester before completing a Masters at Kings College London and then the Bar Vocational Course at Cardiff University. He was called to the Bar in 2009 at Lincoln’s Inn. After being called he took a job working as a Crown Counsel for the Attorney General’s Ministry of Belize, Central America practicing in the Supreme Court of Belize. He subsequently worked as a paralegal in the City of London at Fieldfisher LLP prior to the commencement of his pupillage with 30 Park Place. Nia joins chambers following successful completion of pupillage under the supervision of Claire Williams and Angharad Davies. Nia was educated at Ysgol Gyfun Gymraeg Glantaf, Cardiff and went on to graduate with a 2.1 LLB Law from the University of Bristol in 2010. Nia was previously employed as a Risk & Compliance Executive within the financial services sector and obtained her Diploma Financial Crime Prevention. Nia was awarded the Gray’s Inn Edmund-Davies Award in 2012 to support her study of the Bar Professional Training Course at Cardiff Law School. She was graded Outstanding and was called to the Bar by Gray’s Inn in July 2014. “I am ecstatic to have been offered tenancy at 30 Park Place. During pupillage I was overwhelmed by chambers’ supportive environment and was encouraged by the range of work I was able to observe and undertake.